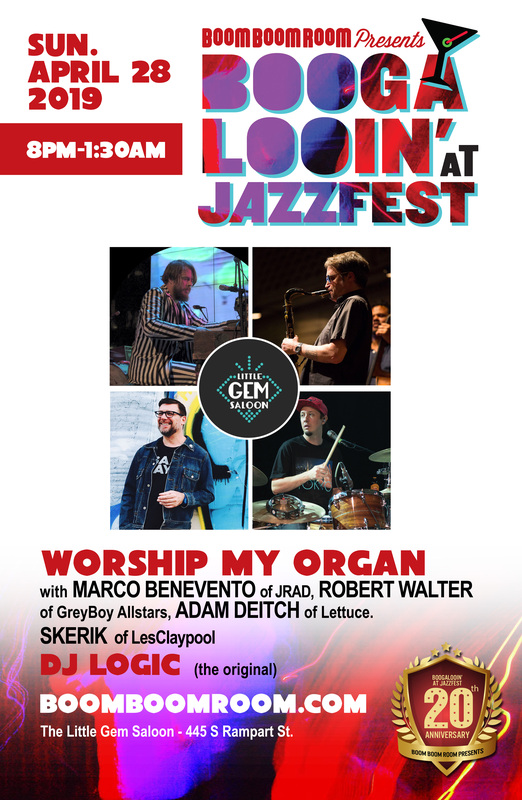 Worship My Organ will be taking place from 8:00 PM til 1:30 AM on the night of Sunday April 28th 2019 at Little Gem Saloon in New Orleans. This show is a JazzFest tradition, ONLY brought to you by BooM BooM RooM Presents, creating an array of sounds, and you can only catch this cast of all star musicians performing together at this very show. This epic show always sells out, so get your tickets NOW! Robert Walter is a keyboard player specializing in instrumental soul jazz on the Hammond B3 organ. He is best known as a founding member of The Greyboy Allstars, Creedle, and his own band, Robert Walter’s 20th Congress. For more than a decade pianist Marco Benevento has been amassing an extensive body of work. His studio albums and live performances set forth a vision that connects the dots in the vast space between LCD Soundsystem and Leon Russell, pulsating with dance rock energy, but with smart, earthy songwriting to match. It has led to numerous high profile appearances, ranging from Carnegie Hall to Pickathon, Mountain Jam to Treefort Festival, while headlining shows coast to coast. Marco Benevento’s latest studio LP, The Story of Fred Short, and its companion live re-lease, The Woodstock Sessions, is some of his finest and most adventurous work to date—a maestro making “bold indie rock” says Brooklyn Vegan, while the LA Times raves, “Benevento continues to straighten his twisted sound into the guise of an indie-rock singer-songwriter, harnessing his inventive sonic palette into rewardingly bite-size pop songs that touch on disco and soul.” Honing his psych rock and late night dance party sensibilities, the recordings find the pianist citing everything from Harry Nilsson, Manu Chau and Gorillaz as inspiration.As anybody who’s seen Marco Benevento perform can attest, with eyes closed, smile wide across his face and fingers free-flowing across the keys, he’s a satellite to the muse. With a devout and growing fan-base, Benevento is an artist whose story is only beginning to unfold. Skerik is an American saxophonist from Seattle, Washington. Performing on the tenor and baritone saxophone, often with electronics and loops, Skerik is a pioneer in a playing style that has been dubbed saxophonics. He has performed with Les Claypool, Garage-A-Tois and more! Adam David Deitch is an American record producer and drummer based in New York City. He is the drummer for the bands Lettuce and Break Science and has worked in the hip hop, funk, electro, pop, and jazz genres, and has collaborated with rapper Wax and soul/jazz singer Ledisi. He was nominated for the 2010 Grammy Award for Best R&B Album for writing and producing two songs on Ledisi’s album Turn Me Loose as part of the Fyre Dept. production team. Deitch co-founded Royal Family Records and has worked with guitarist John Scofield and rapper 50 Cent. *** Be sure to follow @boomboomroomsf to join the Facebook event, and find out more details on special guests, ticket contests, and more!